We are now accepting application for the National Aviation Heritage Invitational. Please follow the application entry links. Stay tuned for more exciting details and news! We mourn the loss of Herbert David Kelleher. The Dates for NAHI 2019, which will be held during the Reno Air Races at Stead Field outside of Reno, Nevada are September 11th to September 15th. The Awards Ceremony will be on Sunday, September 15th. 9/11/2018 NAHI Aircraft on Display This Week! Stihl National Championship Air Races! RENO, Nev. � The Reno Air Racing Association (RARA) and the National Aviation Heritage Invitational LLC (NAHI) are thrilled to present some of the nation's most skillfully-restored aircraft that will be on display at the 55th annual STIHL National Championship Air Races, scheduled September 12-16 at Reno-Stead Airport. This year marks the 55th year of air racing in Reno and is also the year of celebrating NAHI's return to the STIHL National Championship Air Races. Visitors will be able to walk among this historical aircraft exhibit and talk with the owners and restorers at the very place it all began in 1999. A full competition is to scheduled begin in 2019 and is planned for years to come. 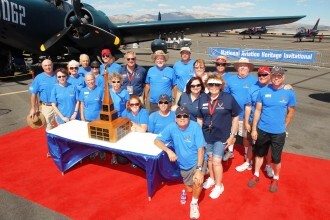 NAHI was an integral part of the Reno experience for 16 years and has hosted some of the finest examples of restored aircraft on the ramp at the STIHL National Championship Air Races. Owners and restorers from all over bring their aircraft to compete for trophies in several categories including military, large, vintage, classic, commercial aircraft and the People's Choice Award sponsored by the Air and Space Smithsonian Magazine. Entrants vie to for coveted Neil A. Armstrong Aviation Heritage Trophy, a striking six-foot tall trophy that resides at the National Air and Space Museum Steven F. Udvar Hazy Center near Dulles Airport in Virginia. The judging criteria was created by representatives of the Smithsonian National Air and Space Museum, and emphasizes authenticity and attention to detail. The Smithsonian is actively involved with NAHI and has representatives from the restoration staff that serve on the judging team annually. "Having NAHI back at Reno is absolutely fantastic!" said Josh Cawthra a previous winner and regular participant at NAHI. "NAHI is the west coast mecca for aviation enthusiasts from all over the world and providing the opportunity for these enthusiasts to enjoy these iconic aircraft that so many have put such hard work into persevering is just amazing!" "I am glad NAHI and Reno have reestablished their partnership," said John Sessions, owner of Historic Flight Foundation and a previous winner and participant. "NAHI deserves the concentration of aviation enthusiasts that Reno attracts every September." The National Aviation Heritage Invitational has held annual competitions since 1999 and has been privileged to have on display some of the finest restored vintage aircraft in the country. 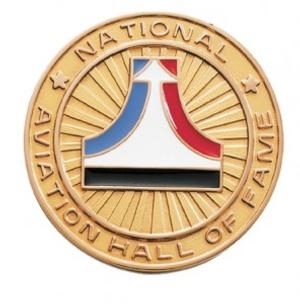 In addition, we have been honored to have hosted many enshrinees of the National Aviation Hall of Fame who have presented trophies to the winners each year. NAHI has a wealth of great photos, stories and information we would like to share with the aviation community. Our new web site, created by Joe Jones and his design team, will become the repository for information on vintage aircraft and a great way to visually walk through the time line of our rich aviation history. The National Aviation Heritage Invitational (NAHI) is very proud to have the Smithsonian National Air and Space Museum as one of its Founding Sponsors. The Smithsonian not only helped establish the aircraft judging criteria but they provide a representative from their restoration team to serve as a judge each year. The Smithsonian is a very active suprporter of NAHI and has the Neil A. Armstrong Aviation Heritage Trophy on permanent display at the Steven F. Udvar-Hazy Center. Flanking the trophy is a monitor featuring a video on NAHI and a new six foot tall banner highlighting examples of former winning aircraft and the namesake of the trophy.... Neil A. Armstrong, the first man to set foot on the moon and an ardent student of aviation history. The National Aviation Heritage Invitational has expanded its scope to not only honor our aviation past but to also help inspire its future. To recognize the new scope and vision of NAHI, we have both updated our logo and rebranded NAHI to reflect our broader and longer range goals for the organization. NAHI supports the youth education video program "Careers in Aviation" created and sponsored by the International Society of Transport Aircraft Training (ISTAT) Foundation. 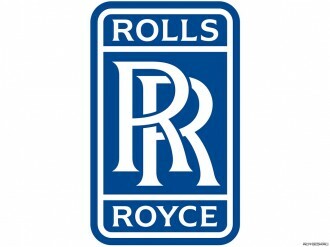 This video series features young adults working in various fields within the aviation industry. The National Aviation Heritage Invitational (NAHI) is proud to be able to name the Best Large Aircraft trophy in honor of Herb Keller, airline industry icon, founder and former CEO of Southwest Airlines. Kelleher, an industry pioneer of the low fare airline model, took Southwest Airlines during his tenure from just three airplanes in 1971 to a fleet of more than 527 airlines in 2008 when Kelleher stepped down. Kelleher stated, "I am incredibly delighted and honored to accept your proposal as to the naming of the large aircraft trophy and suffused with gratitude to you for the idea." 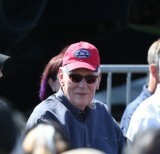 As an enshrinee into the National Aviation Hall of Fame, Mr. Kelleher has been a regular presenter at the event. The National Aviation Heritage Invitational (NAHI) is proud to be able to create the Best Contemporary trophy in honor of Steven F. Udvar-Hazy who revolutionized commercial aircraft financing, was the founder of ILFC, and the driving force behind the Steven F. Udvar Hazy annex of the Air and Space Museum at Washington Dulles Airport. National Aviation Hall of Fame Enshrinees joined presenting sponsor Perform Air in awarding the Grand Champion Neil A. Armstrong National Aviation Heritage Invitational Trophy to the 1944 OY-1 Consolidated Vultee Stinson. This splendid aircraft is owned by Duncan Cameron of Lebanon, TN. Restoration by Duncan Cameron and Tom Westfall.